PLEASE NOTE: PRESURISED PRODUCTS NOW HAVE TO BE POSTED VIA A COURIER. ROYAL MAIL WILL NOT HANDLE THESE ITEMS. Buying this product will earn 258 Loyalty Points. 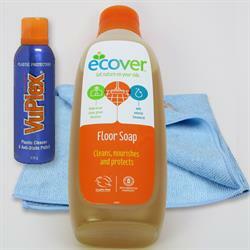 Be the first to submit a review for the VuPlex, Microfibre and Floor Soap set .